Vayeshev Yisra'el baShitim vayachel ha'am liznot el-benot Mo'av. And Yisrael live in Shittim, and the people began to commit whoredom with the banot Moav. Vattikrena la'am lezivchei eloheihen vayochal ha'am vayishtachavu leloheihen. And they called the people to the zevach (sacrifices) of their gods: and the people did eat, and bowed down to their gods. Vayitzamed Yisra'el leva'al pe'or vayichar-'af ADONAI beYisra'el. And Yisrael joined himself to Baal-peor: and the anger of ADONAI (יהוה) was kindled against Yisrael. Take all the heads of the people, and hang them up before ADONAI (יהוה) against the sun, that the fierce anger of ADONAI (יהוה) may be turned away from Yisrael. 25:5 So Moshe said to the judges of Yisrael, "Every one of you kill his men who were joined to Baal-peor." 25:6 And, behold, one of benai Yisrael came and brought to his brethren a Midyan woman in the sight of Moshe, and in the sight of all the congregation of benai Yisrael, who [were] weeping [before] . 25:7 (Maftir) When Pinchas (פּינח) Ben ElAzar (אלעזר) Ben Aharon the Priest, saw it, he rose and left the congregation and took a spear in his hand. 25:8 and went after the man of Yisrael into the chamber and pierced both of them, the man of Yisrael and the woman through her belly. Thus the plague on the people of Yisrael was stopped. 25:11 Pinchas (פּינח), Ben El Azar (אלעזר), Ben Aharon Kohen, has turned My wrath away from benai Yisrael, while he was zealous for My sake among them, that I consumed not benai Yisrael in My Jealousy. Vehaita Lo Ulezaro Akharav Berit Kehunat Olam takhat Asher Kine LeLohav Vayekhaper Al-Benei Yisrael. 25:14 Now the name of the Yisraelite that was shachat (slaughtered), [even] that was shachat (slaughtered) with the Midyan woman, [was] Zimri Ben Salu, a Nasi a chief house among the Shimeonites. 25:15 And the name of the Midyan woman that was shachat (slaughtered) [was] Kozbi bat Zur; he [was] head over a people, [and] of a chief Bayit in Midyan. 25:18 For they vex you with their wiles, wherewith they have beguiled you in the matter of Peor, and in the matter of Kozbi, bat a Nasi Midyan, their sister, which was shachat (slaughtered) in the day of the plague for Peor's sake. the sin of Ba'al Pe'or. First, וַיָּחֶל הָעָם, לִזְנוֹת אֶל-בְּנוֹת מוֹאָב - Israel began to commit harlotry with the daughters of Moav. וַתִּקְרֶאןָ לָעָם, לְזִבְחֵי אֱלֹהֵיהֶן - these women called Israel to sacrifice to their gods. And then, וַיֹּאכַל הָעָם, וַיִּשְׁתַּחֲווּ לֵאלֹהֵיהֶן. and the people ate, and bowed down to their gods. "The broken ו (VAV)" in Numbers 25:12 is telling us that "the Man" has been broken for the sake of Covenant of Peace that brings atonement for Israel. This broken ו (VAV) is a clear picture of the Jewish Messiah, Yeshua. 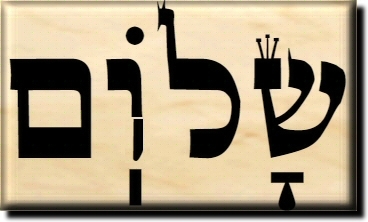 The word "שלום (SHALOM)" in Numbers 25:12, with broken ו (VAV) can be read as "שלים (COMPLETE)." Another explanation that His brokenness is the completion; the finality; the ultimate perfection. promiscuity is taking sexual activity, which is meant to be a tool for a deep and loving relationship, and using it for selfish, superficial pleasure. And idolatry is about taking worship, also a tool for a deep and loving relationship - with God - and making the rituals meaningless, for selfish purposes, to curry favor gods. These are both ways of willingly destroying - or, at least, severely depreciating - the very concept of intimacy. And at the heart of both of these things is not just selfishness - it's a lie we tell ourselves. The idolater, the adulterer, they deceive themselves into thinking that they can have our cake and eat it too. Sure, they'll also use those tools to build intimate relationships, they're not denying that. But why can't they also separate them and just feel pleasure? Because when you remove the relationship part, you really do cheapen those tools... and you cheapen the concept of intimacy itself.